I wanted to end the week on a totally fun note! Sometimes you wanna do something sort of outrageous. Sometimes that goes against what you usually do. In my case, that "something" went against creating something "cute". This is what I always do. This time, it meant I would make something basically awesome. I'm allowed to say that right? I'm allowed to kind of start this blog off with tooting my own horn....right? I've had this idea brewing for a while. I don't know why it took so long to come out. I'm going to go ahead and blame it on the insane last month we had. Yeah...that's it. This inspiration came from what's in front of me..all...the...time. It came from my husband. You see, he's a painter. Well, illustrator- but he uses paints...a lot. Our little apartment's "dining room" triples as my office, and his paint studio. It's quite the site. So, where I work everyday, I'm surrounded by all things art-supplies. Paints, brushes, containers, papers (and I mean PAPERS- who knew there were so many different types of paper! ), palettes, cutters, pencils, erasers, etc. You get the point. Sometimes when things are right in front of you everyday, you fail to actually see them. Which is why I think this idea had been "brewing" for a while and didn't just come out right away. I constantly see palettes...so my brain pushed that idea aside. But alas, it showed itself finally, in all its artsy glory- and I am so happy it did! I love these friggin things! Made of gum paste and royal icing, our new Edible Paint Palette Cupcake Toppers are one of my new favorite items we sell. Sort of an ode to my husband and his artsy ways. Perfect for an art party, children's birthday, or maybe a gallery show! Paint colors are changeable, just let us know what colors really entice your creativity! THOSE ARE AWESOME!!!! It looks so real! And you are right, it would be perfect for a artsy birthday party or gallery show. 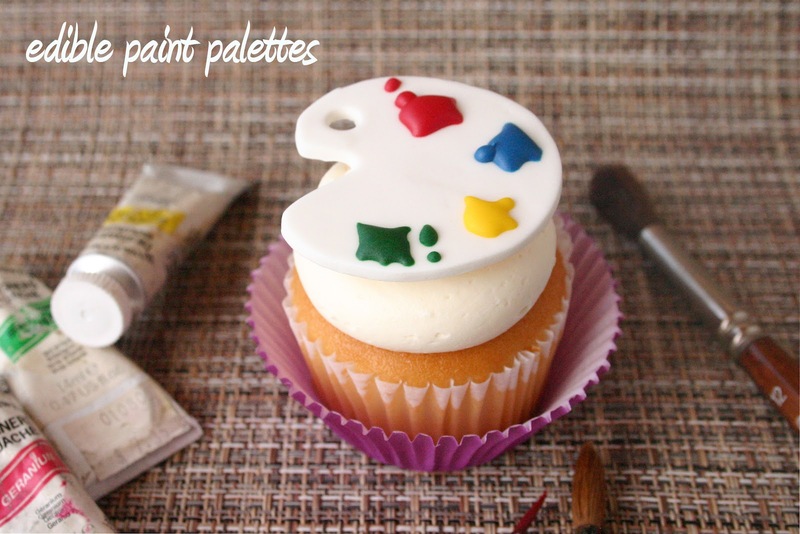 Any artist would love a cupcake with palette on top!